America advanced to the Copa Sudamericana final last night after defeating Millionairos of Colombia 2-0 on the night, 5-2 on aggregate. The Mexican side put in an assured performance in front of their home crowd, taking the lead after six minutes through Hernan Rodrigo Lopez. 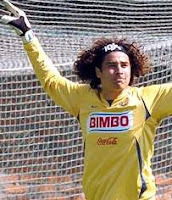 Although Millionairos threatened at times, America goalkeeper Guillermo Ochoa was more than up to the task, pulling off a few good saves throughout. The tie was sealed when Lopez added his second, ten minutes from time, to give America a 2-0 victory and book themselves a place in the final against either River Plate or Arsenal de Sarandi.